In the weeks prior to the "possible leak" of what may be the new Tampa Bay Lightning logo, I came across the fan-made uniform design below. 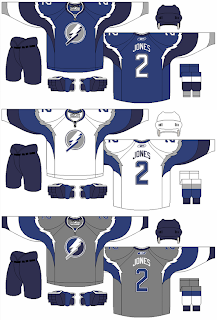 The designer was attempting to redesign the Lightning's logo and uniforms without black. Personally, I think black is an integral part of any Lightning design, but that's just me — a lifelong fan of the team. Just thought you'd all like to see it. Form your own opinions. As for me, I don't like the color combination but I am a fan of the Lightning bolts around the shoulders.